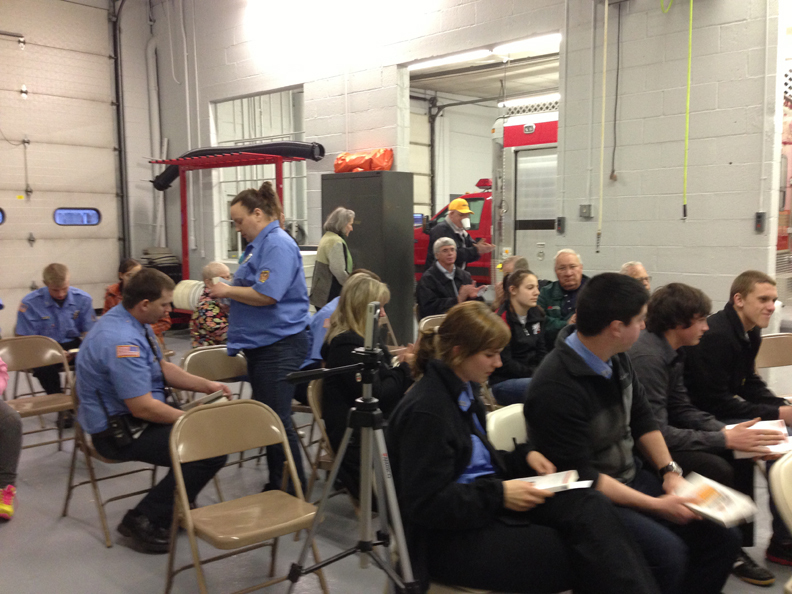 It may have been cold and rainy last night, April 23, but inside the Bear Lake Township Fire Hall, friends, relatives and neighbors came together to say ‘thank you’ to the first responders, EMT’s and Cadets of our local home town Fire Department. Thanks to World Book Night America, we gave a copy of Michael Perry’s wonderful Population 485 to every one of them! 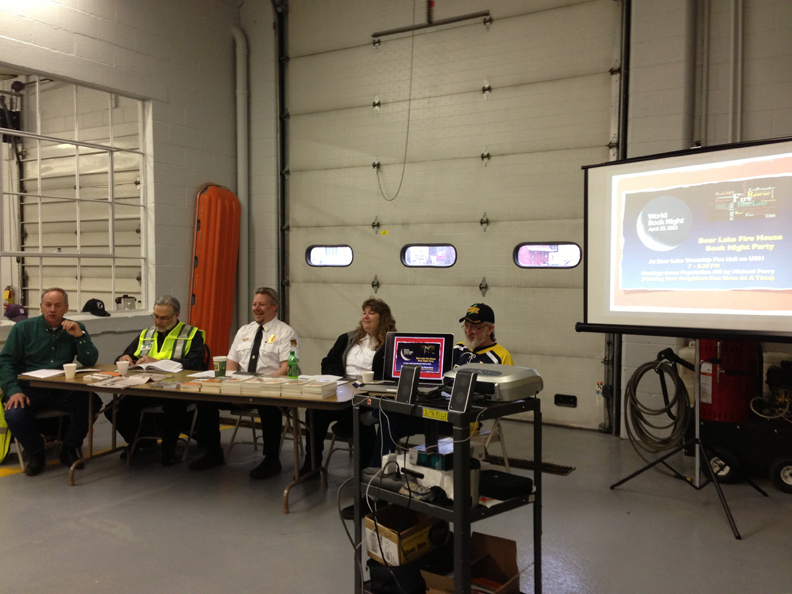 Bear Lake Fire Chief, Sean Adams, was one of the local ‘readers’ for the Fire House Book Party, and introduced the evening. Mike Perry sent a summary of what the book, and this evening’s event, has meant to him which echoed Sean’s sentiment – that when tragedy, heartache or just plain craziness strikes, how nice it is that the person who shows up in your driveway is a friend and neighbor. Jabowski’s Corner: everyone there recognized the story. It may have been about a real event in small New Auburn Wisconsin – but here in Manistee County it’s known as Gable’s Corners. And with High School Graduation just around the corner, the story of love and tragedy struck home. Tricky: in contrast, first responders often are met with utter chaos and just plain crazy people, often the result of staying a little too long at the bar! As the story reads, they train and plan but when the actual situation presents itself it can take on the feeling of being in a reality TV show! Structure Fire: what is it really like to fight a fire in the middle of an ice storm in the middle of a Michigan winter? What is it like to know you’ve just left your brother in the basement of a burning house? And when the rush and rock ‘n roll of the adrenalin fix has dissipated – the reality of rolling back to the fire hall for 3 hours of cleaning, stacking and repacking!! Call: the evening ended with Mike Perry’s voice reading about what it means to find yourself ‘deeply rooted in a place’ and how life in a small town comes with challenges and perks! Such as the right to borrow the community sewer rod! 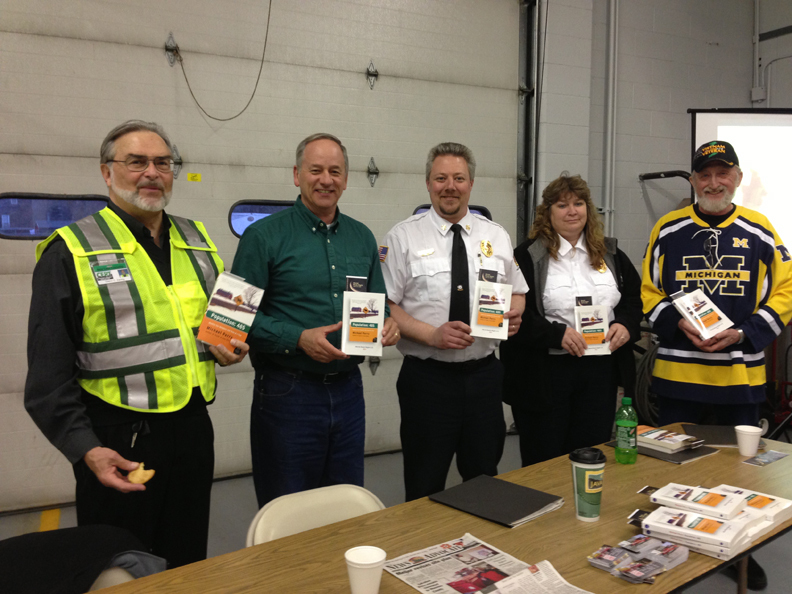 And what it’s like for the 24 folks on Bear Lake Township Fire Department to live life ‘on call’ 24/7 with the pager clipped to their hips night and day. It was an amazing evening, and if you missed it we hope you read Population 485 – this is what we live here for, a sense of shared community, neighbors helping neighbors, and coming to your aid when you call. Thank you BLTFD First Responders and Cadets! From the bottom of our hearts!